It begins, however, with an excavation. The excavation is literal – a skeleton is unearthed – but also metaphorical as, at the last, not only the dead are recovered. Ladybones is performer Sorcha McCaffrey’s first play as a writer. Informed, we are told, by her own experience of obsessive compulsive disorder, it tactically evades the didactic, so that Nuala, the one woman at the piece’s centre, is never reduced to her diagnosis. 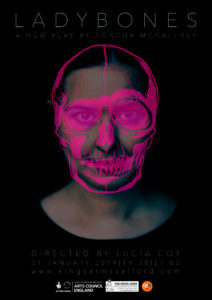 Indeed, recounted via the abrupt febrile elevations and calamitous descents of a life poised uncertainly between adolescence and young adulthood, Ladybones is more girl continuous than Girl, Interrupted. Confident enough to deploy the wheels and pulleys of stand-up comedy to frame and propel the drama, McCaffrey’s commitment to her fictional other is central to the audience’s engagement. Her tonal shifts, from a near-desperate jollity on the surface to the undisguised desperation just beneath her skin, are achieved with a maximum of conviction and a minimum of friction. In this, she is aided by an empathetically understated direction, courtesy of Lucia Cox. Part of the Royal Court writer’s group, McCaffrey has a comic’s ear for language and, at its best, the monologue approaches the quotidian verisimilitude of Victoria Wood; a younger sister with Down’s Syndrome is, for instance, overheard “boasting about her extra chromosome”. A less likely comedic predecessor is evoked during one of the piece’s thankfully-unthreatening bouts of audience participation. In Nuala’s character, cajoling two willing stooges into playing therapist and client, McCaffrey could almost be Larry Grayson fussing over The Generation Game. Bound for Waterloo’s Vault Festival, having previously been performed at both Salford’s Lowry and Islington’s Pleasance Theatre, Ladybones bears the traces of its nurtured development. Much like its protagonist, it is testament to the hope that an unearthed stone, rough with imperfections, can shine like a diamond, given the right setting.